Sr. Theresa Lan Nguyen plays with children at Valley Catholic Early Learning School. The Early Learning School is one of five schools on the Sisters of St. Mary of Oregon campus. Mostly known for education, the Sisters work in several fields. Sisters of St. Mary of Oregon Marianne Giesel, Colleen Schmitt, Charlene Herinckx, Joyce Barsotti, Barbara Rose Sohler and Ellen Therese Berger at the Valentine’s Day Tea, 2014. This summer, the Sisters have many service plans including hosting a car wash to clean the inside and outside of the convent cars, a Vacation Bible School in Ontario, a retreat, service work at Camp Howard, painting the Motherhouse, helping out at St. Joseph Shelter, Mount Angel, teaching English as a second language classes, volunteering at the Sunshine Food Pantry, gardening and visiting L’Arche Nehalem House. For more information about these service opportunities with the Sisters, log on to ssmo.org. BEAVERTON — The oxidized green copper dome of the Sisters of St. Mary of Oregon’s motherhouse is like something out of time at the corner of TV Highway and Murray Boulevard here. The building harkens back to when land in Washington County was more pastoral — used to raise cattle and grow vegetables — not haul commuters back and forth from their jobs and homes. But even though much change has happened over the years here, the building remains a symbol of the continuing influence of the Sisters — the only religious order ever founded in Oregon. “We work hard, pray hard and play hard,” says Sister Charlene Herinckx, superior general for the order. Originally known as the Sisters of the Most Precious Blood, the Sisters of St. Mary of Oregon were founded in 1886. Of German descent, they journeyed from Ohio to Oregon, and for more than 125 years, have turned a dream of serving God into faith and action. Although the Sisters sponsor and are involved in many ministries, they are most known for education on their 43-acre campus. The Valley Catholic school system is the only educational system in Oregon where an infant could be in the same educational system through high school. Valley Catholic Early Learning School, Valley Catholic Elementary School, Valley Catholic Middle School, Valley Catholic High School and Valley Catholic Music School are all located on the campus. Just a few years ago Valley Catholic High School graduated its first group of children who were educated in the system since infancy. Also on the campus and founded by the Sisters in 1963, Maryville is a 181-bed skilled rehabilitative and intermediate care facility. This year, the home opened a new transitional care wing, and increased the number of beds dedicated to rehabilitation from 40 to 52. It also provides memory care specializing in the care of those with Alzheimer’s and other related dementias. “It’s not at all unique to have someone with children in the school drop in to Maryville to see a loved one,” said Sister Adele Marie Altenhofen, president of the SSMO Ministries Corporation. All of the Sisters’ sponsored ministries are separately incorporated and overseen by the Corporation. Over the years the Sisters have adapted their business practices, with the help of lay collaboration, to ensure future growth, accountability and to align their ministries with both civil and canon law. The Corporation over the years has helped define and organize their ministries and helped to maintain the integration of the Sisters’ charism, mission, vision and values into the work. The Corporation also works closely with the SSMO Foundation, established in 1998. The Foundation works to encourage financial aid and community support for the education, health care, and community service ministries of the Sisters. They help the Sisters build and maintain relationships, raise funds, encourage stewardship and market their work. And the arrangements are proving beneficial. The campus will soon have a new maintenance building; Maryville just added 16 new beds; the schools just put in new turf and lights for their athletic field. A newly renovated auditorium for the high school and a new science building addition are also in the planning stages right now, says Sister Adele Marie. The Sisters’ Bethany Center provides educational opportunities for those wanting to learn more about their faith. The center hosts spiritual retreats, seminars and adult religious education. A seminar on human trafficking is set for Saturday, May 2 from 9 a.m. to 11:30 a.m. with Anna Clarke, anti-trafficking coordinator at the Intercommunity Peace and Justice Center in Seattle. “Our goal was to have a place on the west side of town that informed people of their faith and of events and topics that needed our attention in the world,” said Sister Noreen Orazio, director of the Bethany Center. 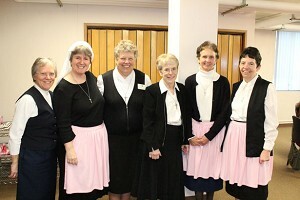 The Sisters run an Associate Program — a recognized relationship between lay men and women and the Sisters. These men and women share in the charism and mission of the congregation within the context of their own lifestyles, leading to a sharing of faith between both the associate and the community. There are 150 Associate members and 30 Sisters serving as contact persons. For the last five years, the Sisters have tackled the needs of the poor by teaching English for Speakers of Other Language classes to the surrounding community. Twice each week, 100 adult students from 18 countries come to the Sisters’ campus for ESOL classes (English for Students of Other Languages). St. Mary of Oregon Sister Rita Rose Stohosky and 20 volunteers help run the program. In 2013, 20 students received their GED certificates. Twenty-five students are currently enrolled in GED classes. They will take their first tests in May 2015. Each year, some of the students become U.S. citizens. St. Mary of Oregon Sister Ellen Therese Berger is working with four students as they pursue citizenship this year. The Sisters’ have also worked hard on sustainability on campus, streamlining recycling programs and managing waste. The Sisters of St. Mary of Oregon and the City of Beaverton host an annual event to address hunger in the region. During its first four years, Soup’s On raised nearly $48,000. Soup’s On 2015 will be held on Saturday, Oct. 3 in the Valley Catholic Athletic Center. The proceeds will benefit the Sunshine Pantry, which provides food, amenities, housewares and clothing to those in need. And there are other ministries off campus, as well. Sister Krista von Borstel is executive director at Catholic Youth Organization/Camp Howard, and Sister Marcella Parrish is the director of St. Joseph Shelter in Mount Angel. All this work is attracting vocations, too. Sister Michael Francine Duncan, the congregation’s director of vocations, says interest has grown. Currently she’s working with two young women who are discerning vocations. She attributes the gain in attention to the dynamic ministries of the Sisters, but also to the fact that their vocations office has tried to focus on meeting young women where they are at — online. Sister Michael Francine says the Sisters have worked hard to personalize their mission, their work and their experiences online in the form of short stories about some of their journeys to Religious life. She still reaches out to the parishes, too, and encourages others who might be interested to pursue a vocation. Sister Charlene is hopeful that the attention her congregation has received during this Year for Consecrated Life (including articles in several other local publications) will educate others about her Religious community and its contributions. “Part of our hope for this Year of Consecrated Life is that some of the mystery or preconceived notions about Religious life . . . can be dispelled and people will be able to see that we are really quite normal . . . and that we have a strong commitment to the church and to serving wherever we are called to serve,” said Sister Charlene. For more on the Sisters’ history, log on to ssmo.org.